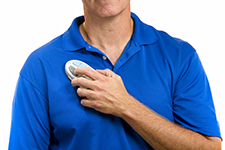 The implant, manufactured by Inspire Medical Systems, works with a person’s natural breathing process. 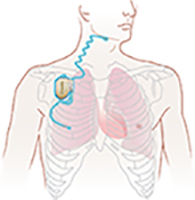 NEW YORK — A state-of-the-art implant designed to treat obstructive sleep apnea (OSA) is now being offered at NewYork-Presbyterian/Weill Cornell Medical Center. The device is the first of its kind approved by the U.S. Food and Drug Administration and is an alternative to continuous positive airway pressure (CPAP), the current standard of care for OSA. 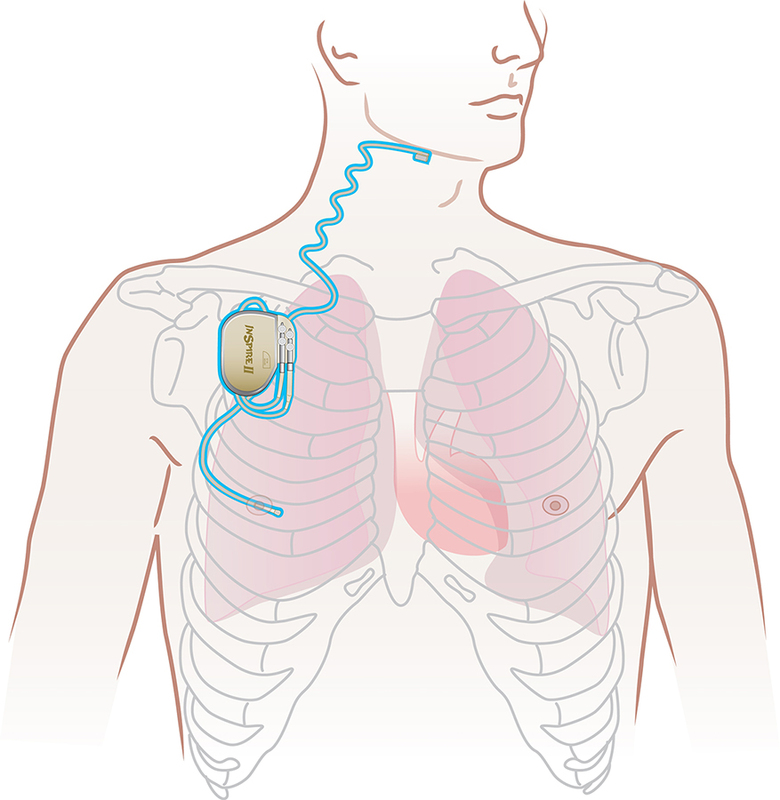 The implant, manufactured by Inspire Medical Systems, works with a person’s natural breathing process. 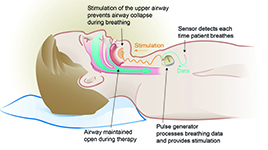 The device is inserted under the skin in the upper chest, and delivers mild stimulation to key airway muscles, keeping the airway open during sleep. The patient activates the device with an external remote control at night and can turn it off upon waking in the morning. OSA poses a wide range of health risks to patients. The condition’s common side effects include daytime sleepiness, depression, weight gain and diminished quality of life. In clinical trials, the implant reduced apnea and hypopnea (shallow breathing) by 68 percent, and 85 percent of bed partners reported little to no snoring in their partner 12 months after activation. In addition, patients reported significant improvements in daytime functioning. The patient activates the device with an external remote control at night. NewYork-Presbyterian/Weill Cornell is currently offering the procedure and device to patients who have OSA and have not been able to use a CPAP mask. For more information, contact the office of Dr. Suurna at 646-962-9135. NewYork-Presbyterian Hospital, based in New York City, is one of the nation’s largest and most comprehensive hospitals and a leading provider of inpatient, ambulatory and preventive care in all areas of medicine. With some 2,600 beds and more than 6,500 affiliated physicians and 20,000 employees, NewYork-Presbyterian had more than 2 million visits in 2013, including close to 15,000 infant deliveries and more than 310,000 emergency department visits. NewYork-Presbyterian comprises six campuses: NewYork-Presbyterian/Weill Cornell Medical Center, NewYork-Presbyterian/Columbia University Medical Center, NewYork-Presbyterian/Morgan Stanley Children’s Hospital, NewYork-Presbyterian/The Allen Hospital, NewYork-Presbyterian/Westchester Division and NewYork-Presbyterian/Lower Manhattan Hospital. The hospital is also closely affiliated with NewYork-Presbyterian/Hudson Valley Hospital and NewYork-Presbyterian/Lawrence Hospital. NewYork-Presbyterian is the #1 hospital in the New York metropolitan area, according to U.S. News & World Report, and consistently named to the magazine’s Honor Roll of best hospitals in the nation. Affiliated with two world-renowned medical schools, Weill Cornell Medical College and Columbia University College of Physicians and Surgeons, NewYork-Presbyterian is committed to excellence in patient care, research, education and community service. For more information, visit www.nyp.org. Weill Cornell Medical College, Cornell University’s medical school located in New York City, is committed to excellence in research, teaching, patient care and the advancement of the art and science of medicine, locally, nationally and globally. Physicians and scientists of Weill Cornell Medical College are engaged in cutting-edge research from bench to bedside, aimed at unlocking mysteries of the human body in health and sickness and toward developing new treatments and prevention strategies. In its commitment to global health and education, Weill Cornell has a strong presence in places such as Qatar, Tanzania, Haiti, Brazil, Austria and Turkey. Through the historic Weill Cornell Medical College in Qatar, the Medical College is the first in the U.S. to offer its M.D. degree overseas. Weill Cornell is the birthplace of many medical advances — including the development of the Pap test for cervical cancer, the synthesis of penicillin, the first successful embryo-biopsy pregnancy and birth in the U.S., the first clinical trial of gene therapy for Parkinson’s disease, and most recently, the world’s first successful use of deep brain stimulation to treat a minimally conscious brain-injured patient. Weill Cornell Medical College is affiliated with NewYork-Presbyterian Hospital, where its faculty provides comprehensive patient care at NewYork-Presbyterian Hospital/Weill Cornell Medical Center. The Medical College is also affiliated with Houston Methodist. For more information, visit weill.cornell.edu.